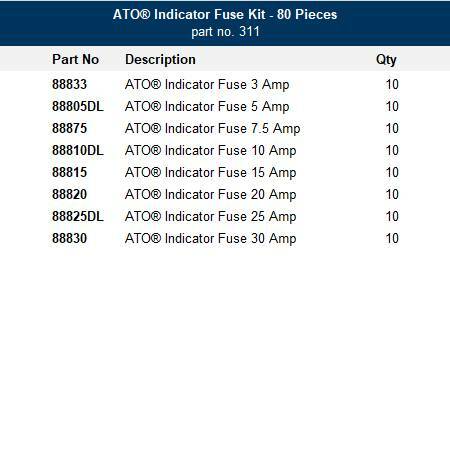 The ATO Smart Glow fuse kit is an 80 piece fuse assortment of ATO Smart Glow fuses. The kit contains 10 pieces each of 3 to 30 amp ATO Indicator fuses that contain an innovative indicator light that glows when the fuse is blown. The assortment is packaged in a tough plastic storage container perfect for the parts drawer, tool box, under counter or road service vehicle. ATO Indicator fuses are rated to 32V DC. Use with a ATC/ATO Indicator fuse holder - Item 79003. The MINI Smart Glow fuse kit is an 80 piece fuse assortment of MINI Smart Glow fuses. The kit contains 10 pieces each of 3 to 30 amp fuses. The assortment is packaged in a tough plastic storage container perfect for the parts drawer, tool box, under counter or road service vehicle. MINI Indicator fuses are rated to 32V DC. 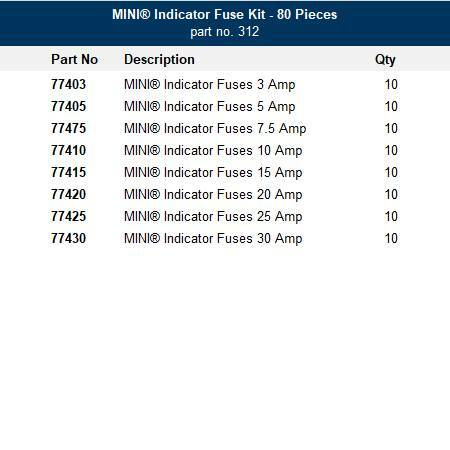 Use with MINI Clear Indicator fuse holders - Item 79007.